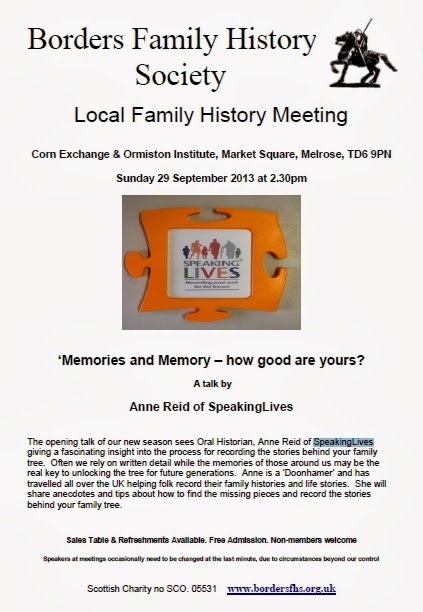 Borders Family History Society: Memories and Memory - how good are yours ? Memories and Memory - how good are yours ? Anne is an oral historian who has travelled all over the UK helping folk record their family histories and life stories. She will share anecdotes and tips about how to find the missing pieces and record the stories behind your family tree. Often we rely on written detail and photographs while the memories of those around us may be the real key to unlocking the tree for future generations. Come to the meeting and gain a fascinating insight into the process for recording the stories behind your family tree.